DALLAS, TX--(Marketwire - February 2, 2011) - The Super Bowl is the biggest sporting event of the year, and preparing a stadium to house this type of event will require a massive effort. This year in particular presents the biggest challenge ever faced by a commercial cleaning company in tackling the challenge that is Cowboys Stadium. With a record breaking crowd expected in excess of 100,000 attendees to watch the Green Bay Packers take on the Pittsburgh Steelers, the task is monumental and it will require the best cleaning crews available to overcome the many obstacles presented. This is where Jani-King stadium cleaning comes in. The pre-clean process is currently under way and will continue up until Thursday night before the big game. This process requires 70 Jani-King crew members to be present each day working on a wide range of tasks including touching up areas where vendors have scuffed walls and prepping concession areas and club houses. After this step, the entire stadium will be swept and security clearances will be reset. All pre-clean tasks must be perfect as they will need to pass tough inspections and receive final approval from a representative from the Dallas Cowboys. On the Saturday just before the game, a quiet atmosphere like the calm before a storm will befall the stadium, with a team of only 30 cleaning crew members preparing small gathering areas for owner's parties inside the stadium. On Super Bowl Sunday, more than 442 Jani-King Commercial Cleaning crew members will assemble at Lone Star Park to receive their game day badges. These badges can only be granted to each cleaning crew member after they have passed rigorous FBI background checks. Security at this event is among the tightest ever seen at a Super Bowl and will only increase should President Obama decide to attend the game. Jani-King took great care to select only the best crew members for the job knowing the size of the task at hand and the heightened security as well as increased expectations this job comes with. Game day cleaning will begin as soon as all Jani-King staff receive their security badges and are bused to the stadium where they will begin cleaning all areas of the stadium including parking lots, outdoor fan plazas, and party pass areas. In all, Jani-King will be accepting the challenge of cleaning up after nearly 105,000 fans and more than 15,000 additional party pass patrons, all while working through the logistics of moving trash from receptacles to collection points and anticipating crowd flow direction changes. Unlike a typical Dallas Cowboys game, the crowd set-up for the big game is different and the overall logistics of the event will change as well as the area to be covered, expanding into 5 additional parking lot areas. Immediately following the game, the stadium will be locked down and the 442 Jani-King staff will be relieved of their duties. At Midnight, 350 new cleaning crew members will take their turn in the more than week long Super Bowl cleaning process as they complete the post-game clean-up and prepare Cowboys Stadium for a 7:30am deadline to be ready for tours and sports broadcasts to occur on Monday morning. 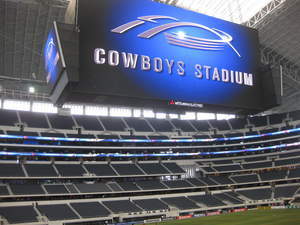 Super Bowl XLV will be unlike any game before it, and Jani-King is proud to be tasked with the job of making sure Cowboys Stadium is in pristine condition to hold this exciting and unprecedented event. With years of experience in the stadium cleaning industry and some of the most dedicated and expert crew members available, Jani-King Commercial Cleaning is the perfect partner to deliver the best stadium experience possible on the biggest day of the year in sports. So in the end, what does it take to clean up after more than 120,000 people? More than 800 Jani-King crew members logging over 10,000 man hours. Jani-King Commercial Cleaning is not only the expert in business cleaning, they also offer a superior stadium cleaning service through cleaning practices that maximize efficiency, dedicated and experienced support to handle any commercial cleaning challenge, 24-hour operations support, and measured inspections. They specialize in providing top quality stadium cleaning and event cleaning services in addition to superior janitorial services to a variety of venues including many professional sports teams' homes.